Notes: Stop is design to fit most engine applications. These COMP Cams piston stop tools are designed to stop the piston in order to find top dead center. They thread into the spark plug hole for accurate use. how do you know where top dead center is to set the tool at the right depth? The piston stop is used to find top dead center when degreeing a camshaft. You would tighten it so that the piston will hit it. You rotate the engine over one way till it hits the stop and mark your degree wheel. Then you will rotate it the other way till it hits the stop again. You take that number plus the other number, divide by two and then that number will be true top dead center. You rotate your engine to that number on the degree wheel and put the degree wheel to zero at this point. first take out all plugs so engine will turn over easy then use socket and breaker bat to rotate engine,with finger over number one plug holr rotate engine till you fell compression (Air blowing out or cly) then use a small screw driver or stiff wire put it in plug hole and rotate engine in same direction until it touches screwdriver hold a little upward pressure on screwdriver rotate engine when piston moves up in cly you will fell the screwdriver move when piston reaches top the screwdriver will stop moving upward if you go to far it will start moving downward back up till you feel it stop moving that pistons is now at top of stroke.insert tool turn adjust screw till you feel it touch piston. mow your ready to take reading on balancer turn engine opposite direction direction till you fell it touch tool,take reading again,turn engine back other direction take reading.if your balancer is correct you will be on zero each time it stops. if not take the two readings and one half of reading will be true top dead center. My after market balancer was off by ten degrees so o used 10 for zero and i could use timing light to set int.timing problem solved! The most accurate is usually lining up the timing marks. You can also use the valve train to locate tdc. 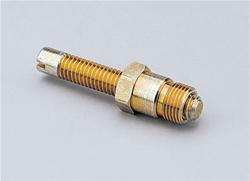 You may be able use a dail indicator, depending on cylinder head,in the spark plug hole. To get top dead center you install this tool and carefully rotate motor until piston contacts. Mark this location then roll the motor the opposite direction until the piston contacts again. Top dead center is directly between these two points. You will want to make or buy a degree wheel to get an accurate position. you just extend enough that the piston contacts it, mark the harmonic balancer at timing pointer, turn engine over opposite direction by hand until piston contacts again, mark balancer at pointer again then TDC is center of the two marks, also watch a youtube video of it. It will work if you have a degree wheel and you dialing in a cam with the heads installed. You find top dead center set your degree wheel and then set your piston stop and then you can rotate your engine back forth and it will stop in the same place every time. The way I do it is watch valves on number 1 piston. Get it to where it is coming up on the compression stroke. With all of your spark plugs out so it's easy to turn with a ratchet on the balancer bolt. Insert the stop tool in the number 1 hole. Turn the crank till it stops. DON'T apply too much pressure!!! Make a mark on your harmonic balancer. Then turn the engine the other direction till it stops again. Make another mark. Split the difference between the two marks. That is TDC of that position. This method works for all makes. This item must have been made with some unknown form of metal softer than aluminum but slightly harder than room temperature butter. After threading it in one time, noticed that some of the plating had come loose inside the bore. Useless if it does not fit. Bought one and It would not fit my SBF GT40 heads. Won't thread into the head. Did not fit my Brodix heads or factory gm heads. Had to file the threads to make it fit. Not sure weather I ordered the wrong size or the coating on it was an issue ,other than that it worked fine.i would recomend this product to others. Worked , BUT I needed to rework the threads. Works good for the job done.